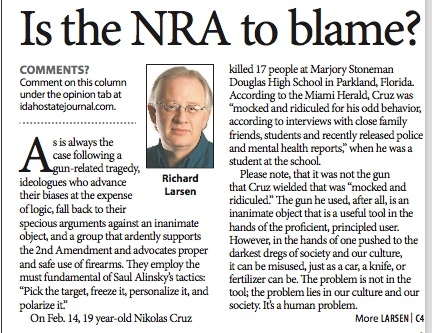 Is the NRA to Blame? 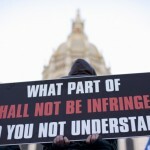 Home Constitution Is the NRA to Blame? Last week, 19 year-old Nikolas Cruz killed 17 people at Marjory Stoneman Douglas High School in Parkland, Florida. According to the Miami Herald, Cruz was “mocked and ridiculed for his odd behavior, according to interviews with close family friends, students and recently released police and mental health reports,” when he was a student at the school. Please note, that it was not the gun that Cruz wielded that was “mocked and ridiculed.” The gun he used, after all, is an inanimate object that is a useful tool in the hands of the proficient, principled user. However, in the hands of one pushed to the darkest dregs of society and our culture, it can be misused, just as a car, a knife, or fertilizer can be. The problem is not in the tool; the problem lies in our culture and our society. It’s a human problem. And the signs of Cruz’s problems were ignored at multiple layers. Extensive disciplinary issues were found in his student file. Local law enforcement had been called to his residence 39 times over the past few years. The FBI received tips about his desire to be a “professional school shooter,” but the tips were not “properly forwarded” or acted upon. In other words, all of the signs that portended his eventual snap were abundantly present, yet nothing was done to prevent his heinous act. Part of the process in finding solutions to such violence is to identify causality. The Second Amendment does not cause these violent actions. Nor does the NRA cause these actions. NRA donations to Congressman do not cause this problem. The greatest cause seems to be related to violent propensities and mental illness and societal instability coupled with the erosion of values and our societal mores, including the value of human life. Those who are logically challenged, yet harbor intense antipathy toward firearms, illogically ascribe culpability for such heinous acts to the 2nd Amendment and the NRA. 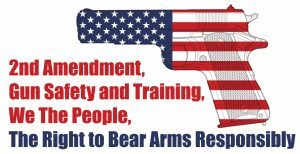 The 2nd Amendment was codified in our foundational legal document to ensure that American citizens could defend themselves against a tyrannical government. After all, our Revolutionary War would not have been won otherwise. 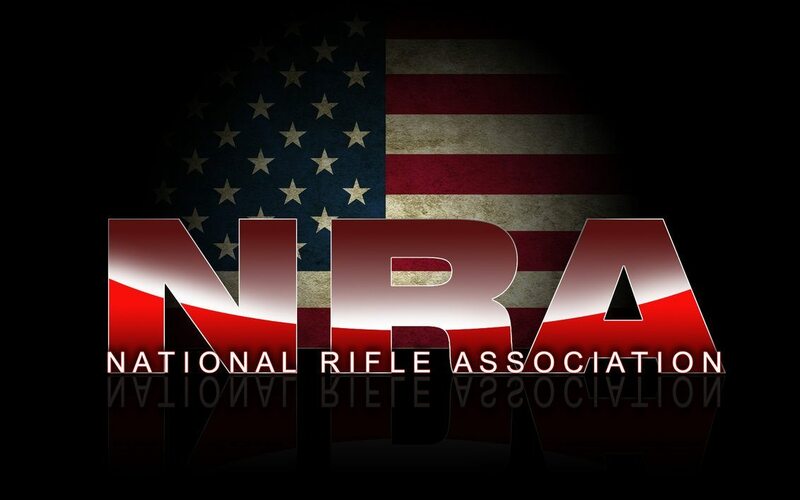 And targeting the NRA is logically lazy, as it is no more than a matter of ideological projection where one’s biases are tethered to the target of their scorn and abject hatred. There is nothing factual in such an illogical leap and false assignation of culpability. Given the NRA commitment to gun safety and proper use, the organization is much more likely to be part of the solution than it is part of the problem. 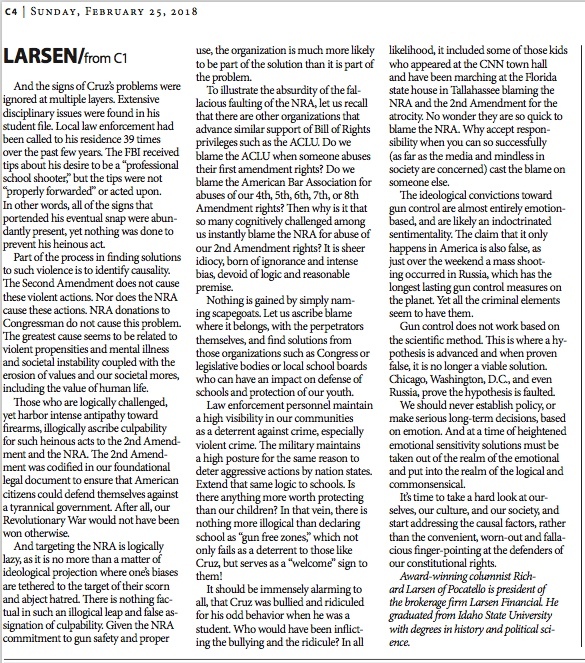 To illustrate the absurdity of the fallacious faulting of the NRA, let us recall that there are other organizations that advance similar support of Bill of Rights privileges such as the ACLU. Do we blame the ACLU when someone abuses their first amendment rights? Do we blame the American Bar Association for abuses of our 4th, 5th, 6th, 7th, or 8th Amendment rights? Then why is it that so many cognitively challenged among us instantly blame the NRA for abuse of our 2nd Amendment rights? It is sheer idiocy, born of ignorance and intense bias, devoid of logic and reasonable premise. Nothing is gained by simply naming scapegoats. Let us ascribe blame where it belongs, with the perpetrators themselves, and find solutions from those organizations such as Congress or legislative bodies or local school boards who can have an impact on defense of schools and protection of our youth. Law enforcement personnel maintain a high visibility in our communities as a deterrent against crime, especially violent crime. The military maintains a high posture for the same reason to deter aggressive actions by nation states. Extend that same logic to schools. Is there anything more worth protecting than our children? In that vein, there is nothing more illogical than declaring schools as “gun free zones,” which not only fails as a deterrent to those like Cruz, but serves as a “welcome” sign to them! It should be immensely alarming to all, that Cruz was bullied and ridiculed for his odd behavior when he was a student. Who would have been inflicting the bullying and the ridicule? In all likelihood, it included some of those kids who appeared at the CNN town hall and have been marching at the Florida state house in Tallahassee blaming the NRA and the 2nd Amendment for the atrocity. No wonder they are so quick to blame the NRA. Why accept responsibility when you can so successfully (as far as the media and mindless in society are concerned) cast the blame on someone else. The ideological convictions toward gun control are almost entirely emotion-based, and are likely an indoctrinated sentimentality. The claim that it only happens in America is also false, as just over the weekend a mass shooting occurred in Russia, which has the longest lasting gun control measures on the planet. Yet all the criminal elements seem to have them. Gun control does not work based on the scientific method. This is where a hypothesis is advanced and when proven false, it is no longer a viable solution. Chicago, Washington, D.C., and even Russia, prove the hypothesis is faulted. We should never establish policy, or make serious long-term decisions, based on emotion. And at a time of heightened emotional sensitivity solutions must be taken out of the realm of the emotional and put into the realm of the logical and commonsensical. It’s time to take a hard look at ourselves, our culture, and our society, and start addressing the causal factors, rather than the convenient, worn-out and fallacious finger-pointing at the defenders of our constitutional rights.